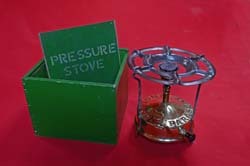 Portable gas stove in green tin with removable top and bottom lids. Round hole in the side of the tin. Hinged pot holders at the top. 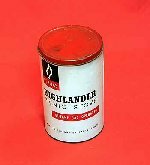 Allanter Alp 7000 Gas camping stove and empty canister. Potholder and stand joined together by metal bolt. Screw for gas canister is attached by rubber tubing. Metal brackets round canister with screw top for attaching tube. Brown Aquascutum military bedding roll.Padded canvas with integral pillow.Three buttons across top and three down for access.Two leather straps with metal buckles lengthwise . Large portable oven with 2 acks and two carrying handles. 2 vents on top and one small one on front left door. Dark green MK2 military camping stove. Hinged lid with door containing removable spanner. Handle on front which pulls out fuel cylinder. Removable pot rest. 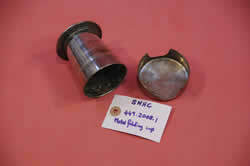 Silver coloured funnel for filling fuel cylinder. 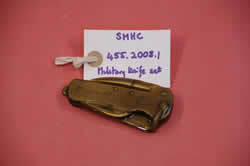 Two hinged handles for carrying. There are ten ventilation holes in the bottom in L shapes-5 to each L.
Hydra Burner Cooker with cover. Cover has two carrying handles. 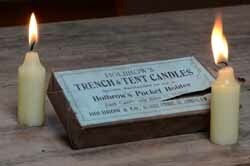 Wax paper parcel with spare parts. 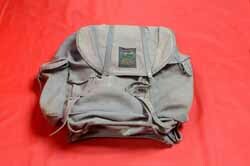 A frame canvas Bergan rucksack with 3 pockets, leather straps and metal buckles. 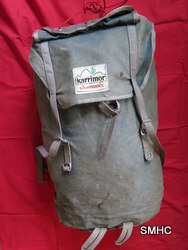 A frame canvas rucksack with large front pocket and drawstring with plastic toggle at top. 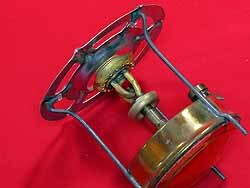 Small brass pulley wheel on back. Nylon tent with sewn in groundsheet with extended valance. Sleeve ventilators.Hemp cord lines. Triangular access. 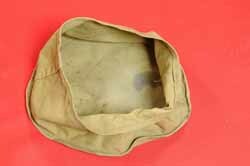 Canvas carrying bag. 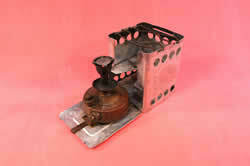 "Blaxburner" paraffin camping stove and seven associated pieces. Stove sits on three legs which also hold three removable pot rests. Removable screwtop for fuelling and removable screwtop for removable burner. Spanner. Two removable parts of burner. Round removable pot rest. 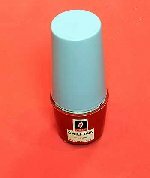 Butane gas camping stove on blue tin with black stripe. Removable screwtop. Legs pull and twist out. Opening on side of tin to access gauge. Eight ventilation holes around top of tin. 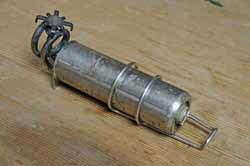 Swiss emergency bivouac cylinder shaped petrol stove. 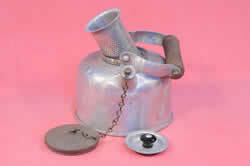 Silver coloured 'Buflam' pressure stove.Base with three hinged feet(legs missing), pump and screwtop for refuelling and burner. Metal cooking pot with lid and carrying handle. 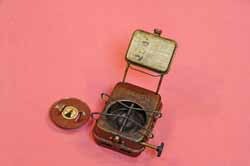 'Burmos' paraffin camping stove in biscuit tin . 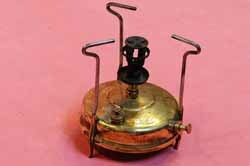 Brass camping stove with removable circular pot rest. Three legs. Screwtop on fuel reservoir. 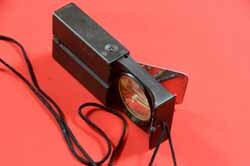 Pump with black plastic handle. Screwtop on burner. Green Military canvas camp bed with detached wooden and metal concertina frame. 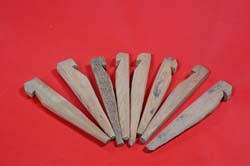 Folds in two places with three wooden poles at each side. Fold over flap at top. 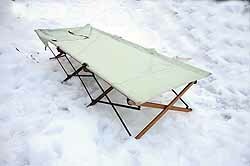 Blue canvas camp bed which can fold in half. Two metal poles along each side with two metal holders on each one. 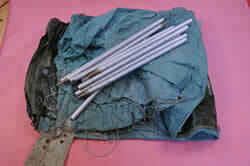 Four detachable metal poles for attaching to metal holders for stands. Beige hessian camp bed. Folds into five parts. 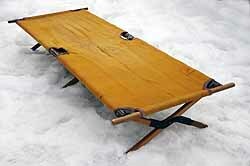 Wooden frame and six legs all attached to canvas bed. Metal hinges. Two separate poles with canvas loops. Orange hessian camp bed. Folds into five parts. Wooden frame and six legs all attached to canvas bed. Metal hinges. Two separate poles . Nine patterned canvas straps crossing below hessian bed. 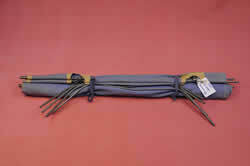 Long hessian strap for tying and hessian loop for carrying. 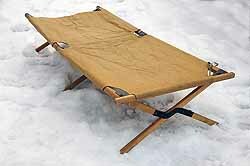 Brown canvas camp bed.Folds into five parts. 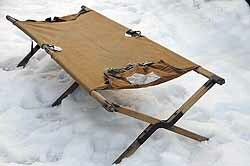 Wooden frame and six legs all attached to canvas bed.Metal hinges. 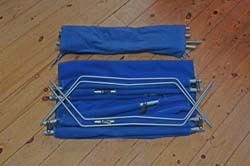 Two camp beds with detachable legs and tubes. In 'a' the tubes are hinged and there are four legs. In 'b' the tubes are unattached and there are three legs. Methylated spirit cooking set in leather case. 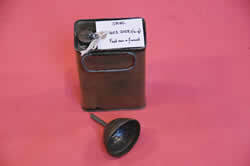 Removable candle holder in hinged metal box with glass window. Hinged metal carrying handles on wood base on the back. 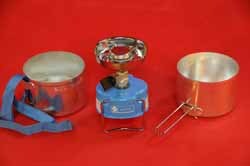 Chalwyn collapsible pressure stove and associated parts. 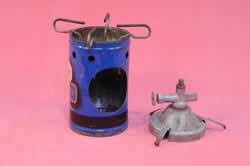 Paraffin Stove in blue Christiania Glasmagasin hinged metal box with carrying handle.Three pot rests, and two burner parts. 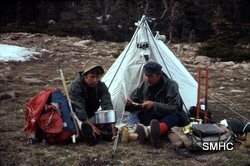 'Clan' double skin Mountain Tent. Pentagonal shaped. Yellow sewn in waterproof groundsheet. Press stud opening at one end. Snow valances on each side have metal edged holes for poles. There are sixteen poles altogether. There is a tunnel opening with tapes and an air vent. Eight metal rings with nylon string attached inside. 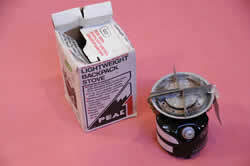 Coleman 'Peak' lightweight backpack stove in original box. Fold out legs, self contained pump, built in wind shield and automatic tip cleaner. No loose parts. 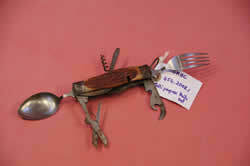 Cutlery sets - spoon, knife and fork held together with metal clip. 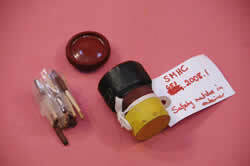 Red plastic container with safety matches. Yellow rubber top. Screw off bottom. Black elastoplast tape has been wound round middle. Safety matches inside. Swedish Army cook set with plastic spirit bottle inside. 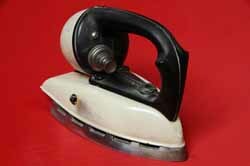 Black metal removable pot holder outside with two fold up metal pot rests,fourteen holes and large hole in bottom. 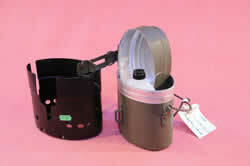 Green billy can with lid, carrying handle and hook. 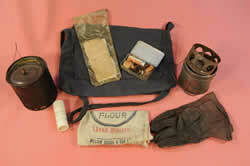 Cooking Kit, comprised of cotton bag containing two metal cooking cans (in own cotton bags), tin containing matches and tinder, tube of Hexamine solid fuel tablets, plastic wallet containing tissue and paper, pair of leather gloves - Women's , Small. 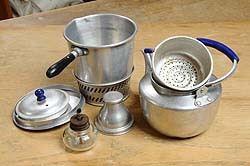 Cooking set consisting of teapot, pot and spirit burner. Metal kettle with removable brass lid. Raffia handle joined to water spout screw by a metal chain. Kettle sits in round base which has 9 ventilation holes. In base there is a removable spirit burner. 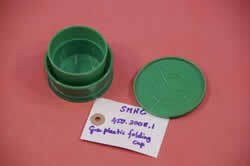 Green plastic folding cup with removable lid. 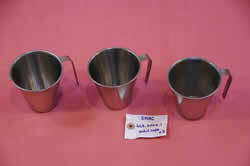 Norwegian Army issue metal cups. Long handle attached at top. 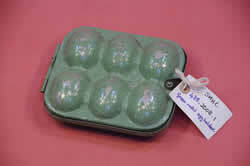 Green metal egg holder for six eggs. Hinge and leather strap and press stud for closing. 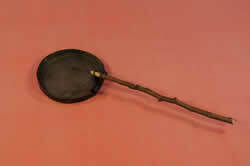 Frying pan, metal, circular, bull dog clip attached, black; Stick, wood, stripped end used to lift pan via hole in top of bull dog clip, brown. 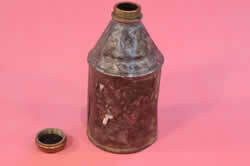 Bashed metal bottle with unscrewable top. Green military fuel can and funnel. Can has movable handle. Screwtop joined to handle by a short chain. Funnel has mesh sieve. Can is covered in plastic tape. Unused gas stove in its original box with instruction sheet. Former grenade tin and lid used for cooking. Pot holder. 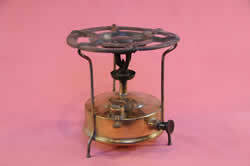 Brass Hipolito camping stove with three removable pot rests. Three legs. Removable screwtop on fuel reservoir. Pump. Mixture of English, French and Arabic writing on stove. 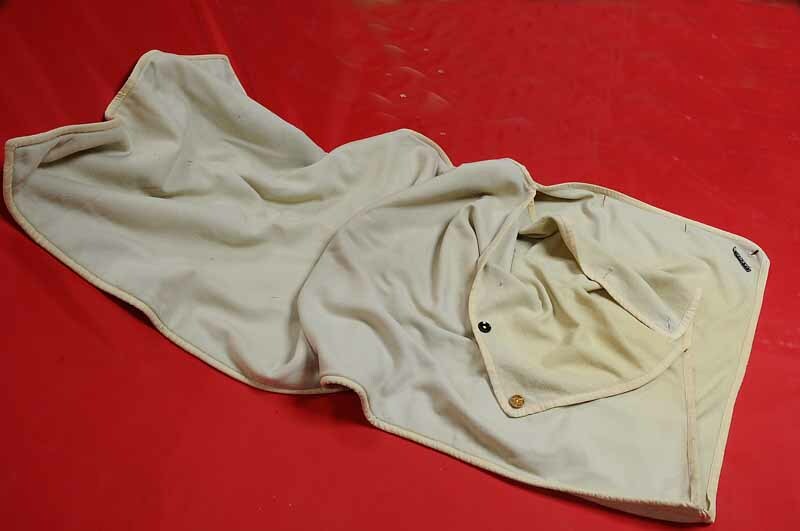 Rectangular shaped blanket sleeping bag with taped edges and three large button holes and buttons. 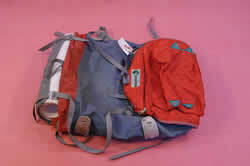 Blue and red canvas 'Karrimor' rucksack with drawstring top and nylon straps with metal buckles. Rolled up piece of foam attached to bottom and red nylon zipped bag attached to top. 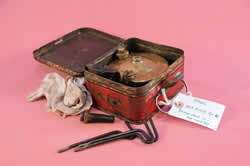 Camp stove and parts in original cardboard box. 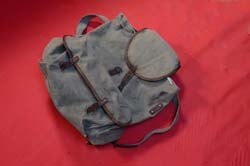 Small blue cotton rucksack with canvas straps and metal buckles. Drawstring round top. Large canvas Karrimor Outward Bound 11 Rucksack with drawstring top and two side pockets and padded shoulder straps. 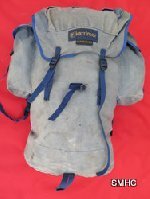 Large blue Karrimor rucksack with side pockets, canvas straps, metal buckles and cord drawstring top. 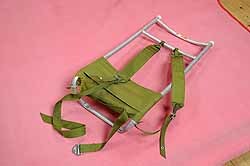 Hollow silver metal tubular frame with lovat green padded carrying straps and back rest and metal buckles. Small silvery camping kettle with wooden handle. 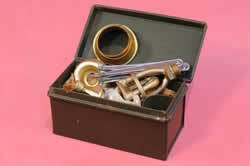 Unscrewable brass top and spout top joined with chain. 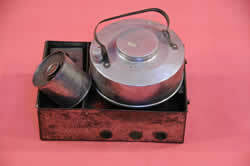 High speed kettle set in rectangular metal box. Removable lid with handle. 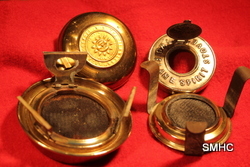 Two compartments inside tin. In first compartment , round kettle with hinged carrying handle and removable screw top lid. Horn multi purpose knife set with folding fork and spoon and corkscrew. Metal carrying ring. 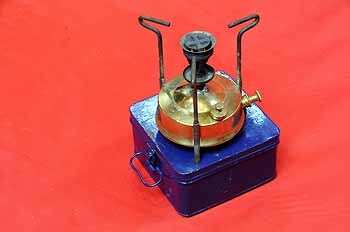 Rusty blue tin box with leather handle containing portable double burner cooker/heater which has a gas cylinder with valve, folding metal plate and metal grid. Also has a lighting attachment. Large plywood box and metal griddle and lid. Two rope carrying handles. 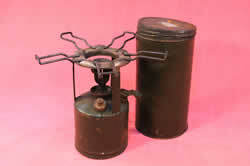 American made military camping stove with three hinged feet.Cylindrical shape.Three fold out pot rests. 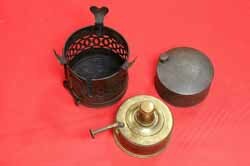 Three part brass spirit stove:- container and stand, spirit burner and fuel container. Cylindrical holder with lid has round holes at bottom. Spirit holder with removable lid. Brass stove with hinged pot rest. Unscrewable top in centre. Wooden carrying handle. Green military bedding roll i.e. 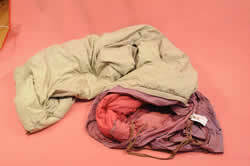 Early sleeping bag normally used by horse drawn troops. Two leather straps with metal buckles lengthwise and three leather straps and buckles down sides. Brown flannel lining. Canvas with leather edging. 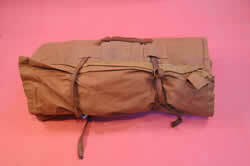 Green military bedding roll i.e.Early sleeping bag normally used by horse drawn troops.Two leather straps with metal buckles lengthwise and three leather straps and buckles down sides.Navy flannel lining.Canvas with leather edging. 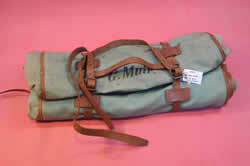 Khaki canvas satchel with metal clasps and a shoulder strap. 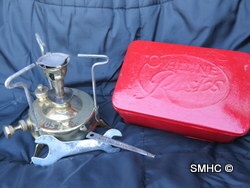 Portable camping stove, primus type in silver coloured metal storage box with handle. Fuel type paraffin. Box has hinged lid and simple press button opening mechanism. 8 ventilation holes on three sides of tin , 24 in all. The stove is designed to be used inside the tin and the tin acts as a pot rest. It has removable screwtop for fuel reservoir and has a pump and a removable priming dish. It has removable spreader plate. 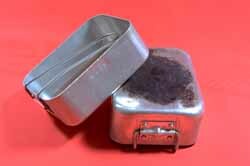 Portable camping stove, primus type in silver coloured metal storage box with handle. Fuel type paraffin. Box has hinged lid and simple press button opening mechanism. 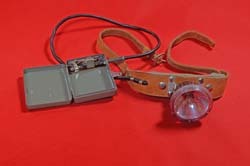 Inscription "MONITOR" on front of tin and red sticker with "the seal of safety and efficiency British made MONITOR tested and guaranteed" on lid. 8 ventilation holes on three sides of tin, 24 in all. The stove is designed to be used inside the tin and the tin acts as a pot rest. The stove is removable. Inscription "BRITISH MADE MONITOR" on top and "PARAFFIN ONLY" on side. It has removable screwtop for fuel reservoir and has a pump and a removable priming dish. It has removable spreader plate. 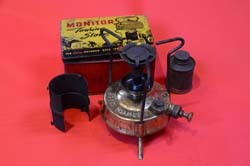 Small Monitor paraffin stove and associated parts in the original tin. 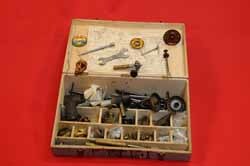 Brand new brass 'Monitor' wickless oil stove and associated parts in original unopened cardboard box. 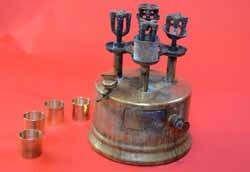 Brass camping stove with six associated parts. Base with three hinged feet, pump and screwtop for refuelling and screwtop for burner. Three cylindrical holes for removable pot rest. Spanner. Burner and rest. Metal strip with pin on end. Instructions for use. 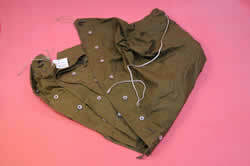 Green oilskin drawstring sack containing green military mountain tent. Twelve metal poles. Nylon tent. 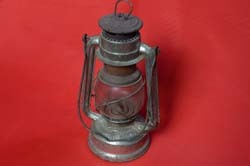 Spirit lantern with carrying handle. 'Norwegian' self acting cooking apparatus and simple refrigerator. Large wooden box with hinged lid and metal carrying handles on both sides. Felt padded inside with two round pots with lids and handles. Round felt padded cushion sits on top of the pots. 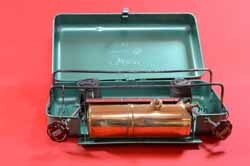 Optimus 00 paraffin camping stove in green metal box with eleven associated parts and one label. 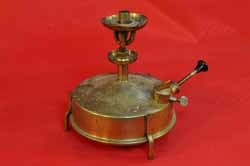 Brass base with three hinged feet and holes for three pot rests, metal spirit bottle, three pot rests, burner, spanner, cleaning needles in packet, red label, three parts for burner. 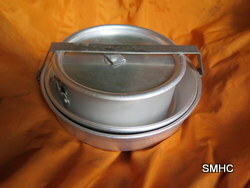 OPTIMUS 111b camping stove in square silver metal case. 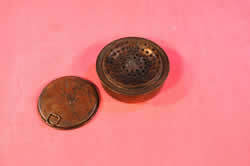 Hinged lid with metal catch. 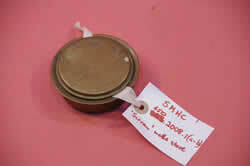 Inside, burner and cylindrical brass fuel reservoir which has pump and screwtop for refuelling. Adjusting handle attached by metal chain. Safety plate attached to reservoir. Metal handle for carrying on back of case. Optimus 510 rocket stove with 4 flame tubes and a handmade box. 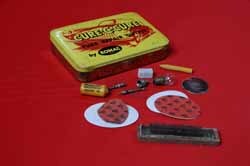 Optimus petrol stove inside tin with two prickers in paper packet. Optimus camping stove in square blue/green metal box. Box has hinged lid with catch and hinged front. 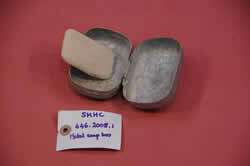 Two removable pot rests and two metal rods, one cylindrical. Burner and cylindrical fuel reservoir are joined and reservoir has protection plate. Reservoir has screwtop. 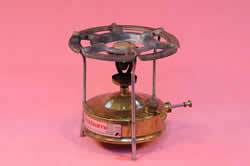 Brass OPTIMUS No 1 paraffin camping stove with removable circular pot rest. Three legs. Removable screwtop on fuel reservoir. Pump. Mixture of English and Arabic writing on stove. 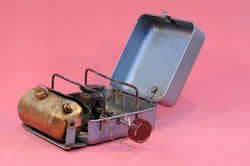 Rocket packaway stove in metal tin box with carrying handle. 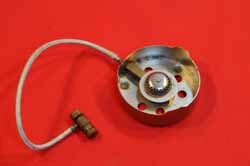 Parasene stove and associated parts. Green wooden box. 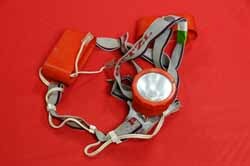 Orange plastic headtorch and battery case and nylon headband. 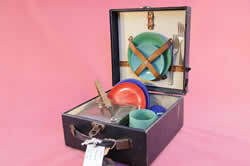 Picnic set in green leather bound wooden carrying case. Incomplete set includes two green 'beetleware' cups, two plates and three broken saucers. Four red plastic plates and two blue 'Bandalastaware' plates. Two metal forks and a red and a green cup with lids. 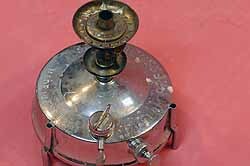 Also a silver plated stove with basket weave handle. The stove has fretwork round the outside . Metal head torch on elasticated headband. 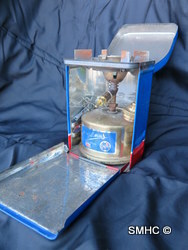 Pile Wonder Torch in original box. Torch has metal clip on back. 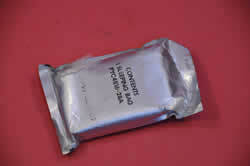 Foil packet containing folded plastic sleeping bag. 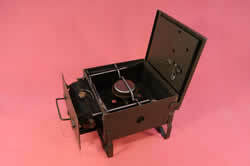 Brass camping stove with pot rest attached to the legs in original cardboard box. 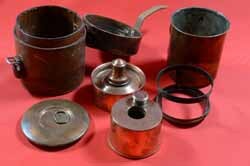 Brass 'Primus' stove, with fourteen associated parts and instructions for use sheet, in original red metal box. 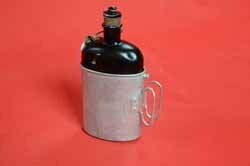 Screwtop lid for refuelling, pump and screwtop for burner. Three cylindrical holes for removable pot rests. 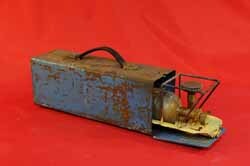 Box has hinged metal carrying handle. 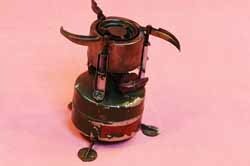 Primus stove in red metal box. 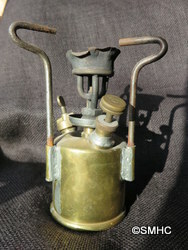 Small brass camping stove with eight associated parts. Base has three retractable metal feet, unscrewable lid for refuelling , pump and unscrewable lid for burner. 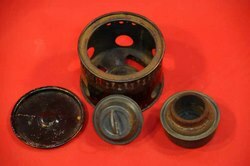 Three cylindrical holes for removable pot rests, spanner and fuel bottle. Box has hinged metal carrying handle. 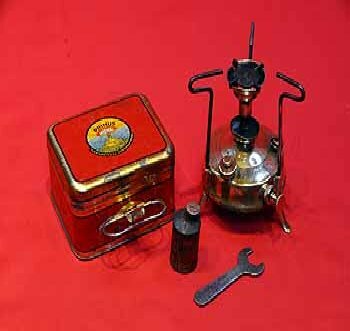 Primus stove in red metal box. 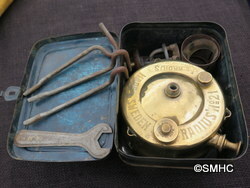 Small brass camping stove with twelve associated parts. Base has three metal feet, unscrewable lid for refuelling , pump and unscrewable lid for burner. Three cylindrical holes for removable pot rests. Box has hinged metal carrying handle. Primus 210 camping stove. Fuel pump on base and removable screw for refuelling. Pot rest attached to three feet which turn out. Screw bracket on side for attaching to a bicycle. 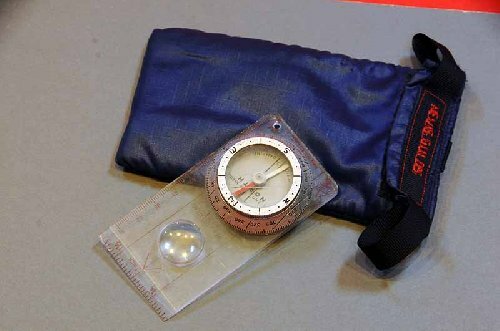 Portable Primus petrol camping stove in red and blue Optimus tin with white stripe. Box has hinged lid and front folds down to access stove. Box has 4 ventilation holes. 2 on each side. The stove is designed to be used inside the tin and the tin acts as a pot rest. The stove is removable. There is a fuel key attached by a chain. It has removable screwtop for fuel reservoir. The spreader plate rotates. WARNING -Some fuel remaining in reservoir. 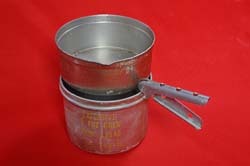 Primus No.210 camp stove and parts in tin. 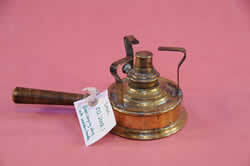 Primus stove converted from brass paraffin blowlamp. 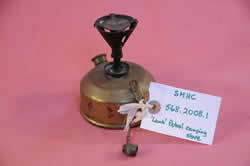 Small Radius petrol Stove with attached key. 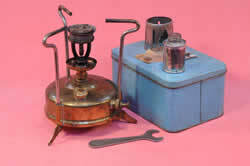 Small paraffin stove with with associated parts and retractable legs in original tin box . 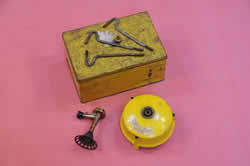 Yellow tin with 'Rambler' camping stove and associated parts. 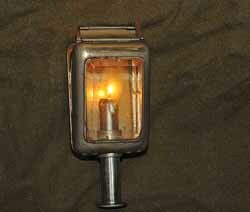 Small brass camping stove. Base with three hinged feet, pump and screwtop for refuelling and screwtop for burner. Three cylindrical holes for removable pot rests. Burner. 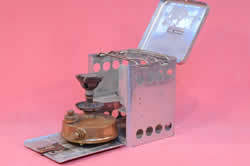 SHINABRO 680 brass kerosene camping stove. Base with pump and screwtop for refuelling. On top screwtop for burner. Burner and three metal pot rests loose . Three cylinders on base for pot rests to slide into. Guard for burner also removable. 'Black's' down sleeping bag. Hood with cotton tapes at the top. Khaki coloured with purple lining. Metal soap box and soap. Hinged lid. Military green rectangular box with nine waxed packets containing various spares for camping stoves. Box has hinged lid and catch. 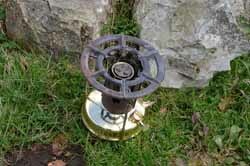 Stesco Hiker's stove with three legs in a round tin. 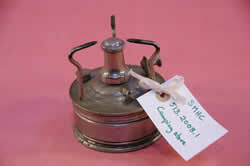 'Sirram' meths camping stove. 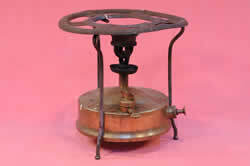 Round brass stove with removable lid. 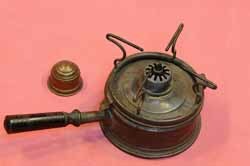 Brass camping stove with wooden handle. Three metal pot rests attached. Removable burner with pump and screw top. 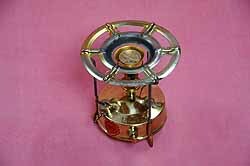 Small round brass spirit stove. Removable lid with handle. Camping stove. Three metal pot rests attached. Removable screwtop on burner. Screwtop for fuelling. Screw flame adjustor. 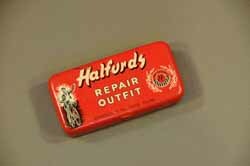 Blue square tin with metal clip.Removable camping stove inside.Blue leather carrying handle. Aluminium Swiss Army water bottle with removable mug and folding handles.Bottle has a cork stopper. 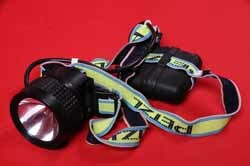 Headtorch attached to foam backed leather strap and battery case. 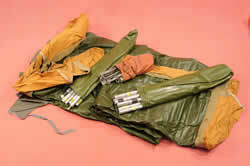 Green bag containing tent and poles. 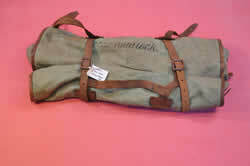 'Black's mountain tent in grey canvas bag. Orange tent with green sewn in groundsheet. Two waterproof bags with eight poles in each. 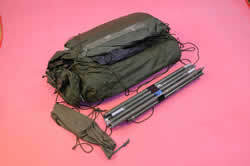 One small cotton bag with 14 channel tent pegs and 14 round tent pegs. 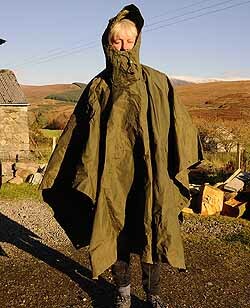 Green military waterproof tent sheet/cape.Nylon cord drawstring on hood. Eight eyelets and sixteen press studs around the edges. Green diamond shaped military tent sheets. Three holes and braided loops at each point. Fifty two studs and button holes round edges. Two holes with braided loops in middle of each edge. Pocket type hole in middle. Metal clip with screw clamp. 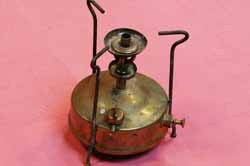 Homemade paraffin stove with double burner. Tin plates. 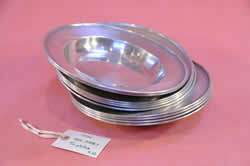 Round soup plates. 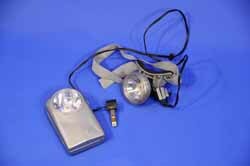 Small black waterproof headtorch with elasticated headband.Spare bulb at back of lamp. 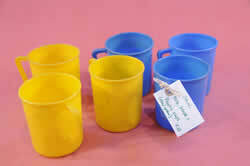 Plastic mugs. Five yellow and five blue. 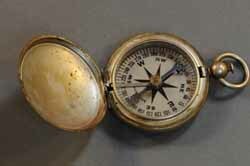 US Air force pocket compass with Wittnauer dial. 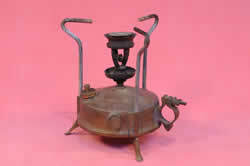 Brass camping stove with three pot rests. Unscrewable filler cap.Pump. Cylindrical grey and red plastic lidded stove with three pot rests and retractable legs in base. 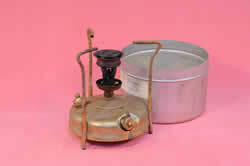 Butane stove with three pot rests in cylindrical tin which acts as holderwith clip over legs.Also original cardboard box. Also Veritas book of stockists. 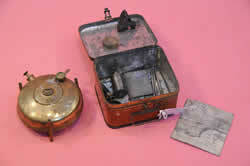 Picnic stove in original tin with instruction sheet, jet clearing needle in packet, three pot rests, and detachable burner. 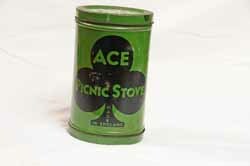 Camping stove in green cylindrical tin.Rusty, round tin which contains a few metal objects. 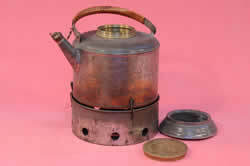 Removable paraffin stove with 5 movable silvery hinges for pot rest on top and three movable hinges underneath for resting stove. Pump on stove and removable screwtop for fuelling. 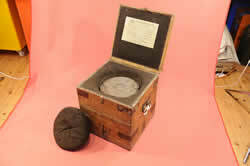 Silver coloured sloping wooden box with various compartments containing assorted spares for 'Primus' stoves. Hinged lid.